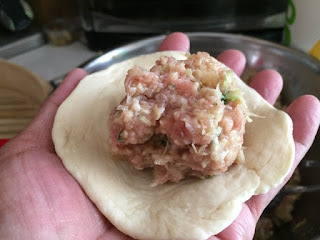 This is one of the few more fun preparing Chinese BAO filled with Pork and Vegetables. Mix dry ingredients thoroughly in a medium size mixing bowl - just use a whisk. Warm 2 Cups of tap water. 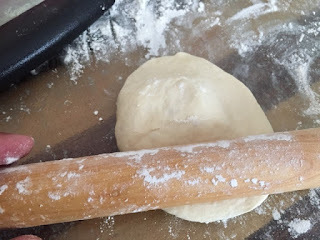 Add 1 C warm water to mix dough with chopsticks or ladle, etc. Make into a shaggy dough. Add 1/2 C more water onto dry flour at the bottom of the bowl. Add warm water 1 Tbsp at a time at this point until all dry flour is gone. The dough should be soft. Transfer to work surface. Knead for 2 minutes until a good ball is formed. Cover with plastic and let rise until double in size. Chopped any vegetables you like. 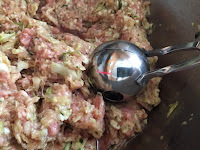 Add ground pork and mix well but not so much that you end up with tough mixture. Do the gentle folding motion. 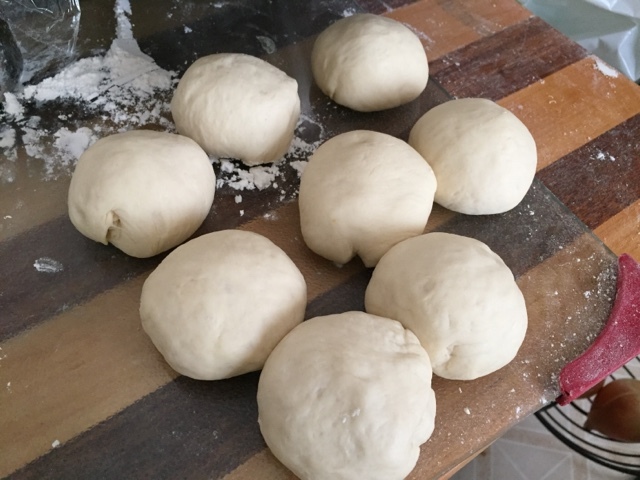 Roll out the dough onto work surface. Form into a long rope and divide into workable size. Portion the dough - I had 9 - 60 g/ea dough for large BAO - and 12 - 56 g/ea for nice satisfying size BAO. 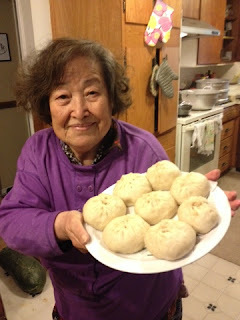 Form into round ball - Tuck ends and extra dough during weighing and round the dough with the palm of your hand. 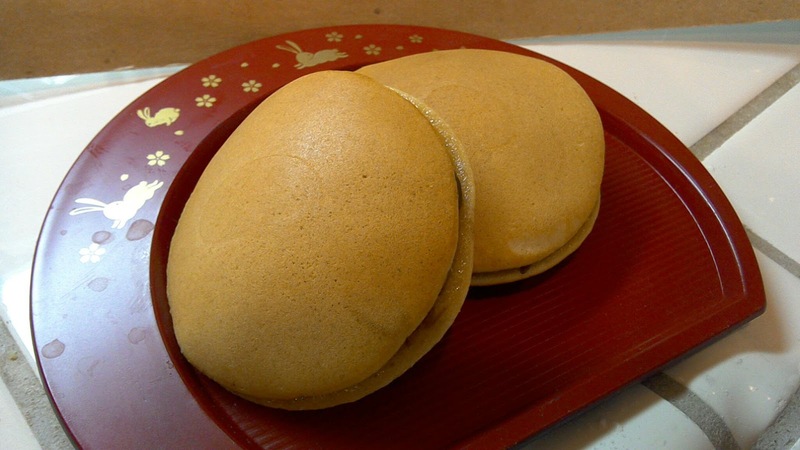 Keep them covered or use a cake pan with cover while you are working to fill the first dough with meat filling. Prepare Steamer basket and start boiling water. Roll out the dough. Thinner on the outer edge. Because you will be folding the edges together, it will even out. Leave center thicker. You need to have done this several times already to what is the best thickness. 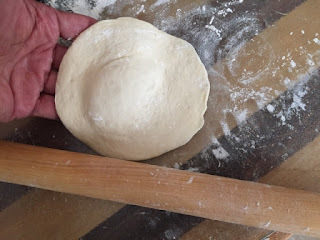 The way you will be folding and pulling the dough will result in different thickness. TIP: You could try with a couple of them them first and let rise covered for 15 min then, steam them first to see the result. I thought it was too much meat filling, but it turned out A-Okay. Pinch close with thumb with index finger curled inward. Pinch the top by gathering the succeeding skin next to your index finger. Pinch close the end with a twirl. Place a cut parchment paper under it. Cheese cloth spread over the bottom of the steam would work also, but I prefer parchment paper (organic parchment paper is even better). 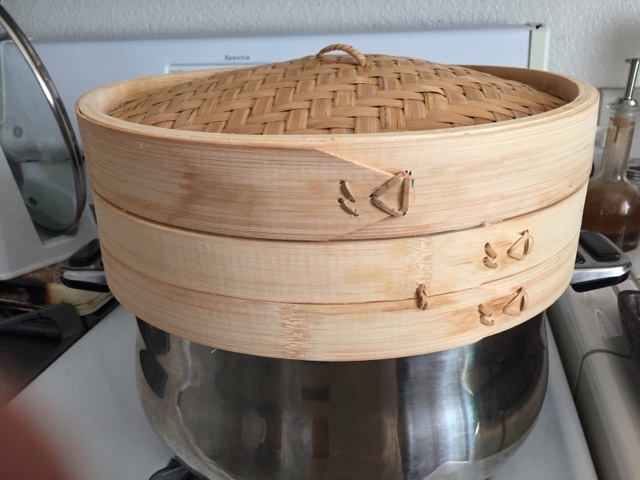 I decided to use my bamboo steamer. 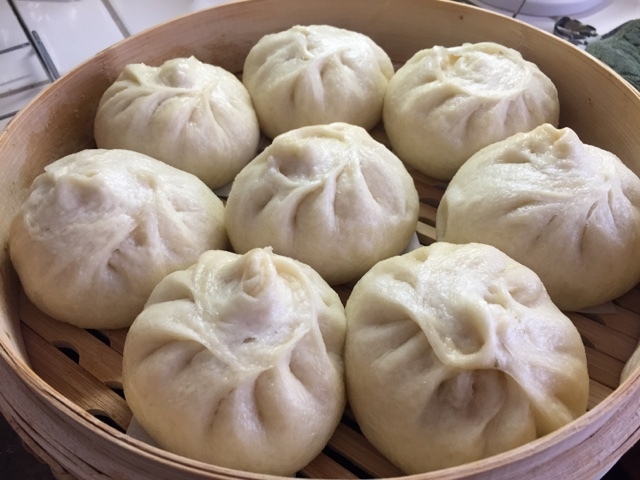 It absorbs the steam droplets better without dripping and wetting the BAO. I steamed one basket layer at a time. While one basket is steaming, prepare the 2nd basketful. Keep the BAO covered with plastic while waiting. Steam at high. Steam for 20 minutes (for these sizes) - done! Remove the basket over a cookie sheet. Prop one end on the rim. Wait for few second. 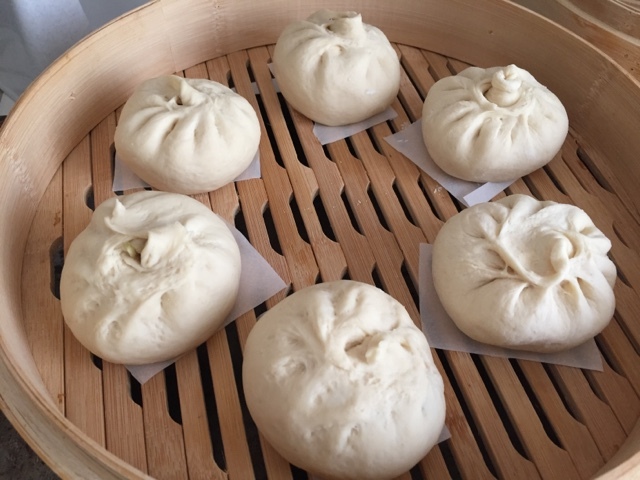 Remove the lid and transfer the Bao to cooling rack. Perfect for my own effort. Yum! I am no sure where I got this recipe for the BBQ Pork Buns now. It's been a while since I typed up the draft copy. This formula uses half the dough saved from previous product and half of the new product dough. Basically a Preferment saved from the previous dough, then, half of the new dough are mixed together. 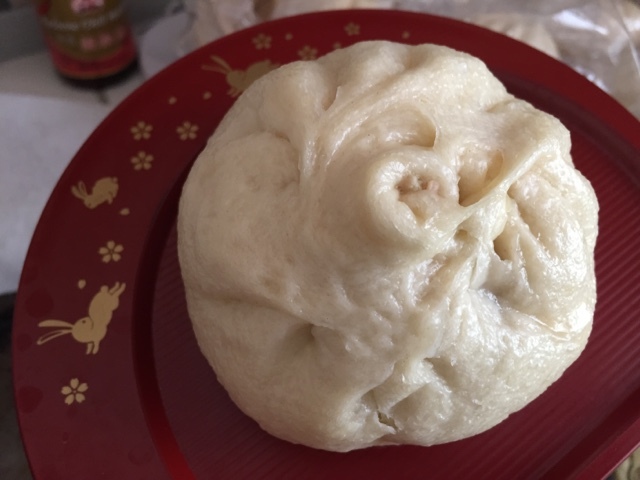 If you have no plan to make the Bao two days in a row or make something else the next day, just do the Preferment and on the next day cut the Dough recipe into half instead of 3 Cups, etc. Preferment dough - A day before. 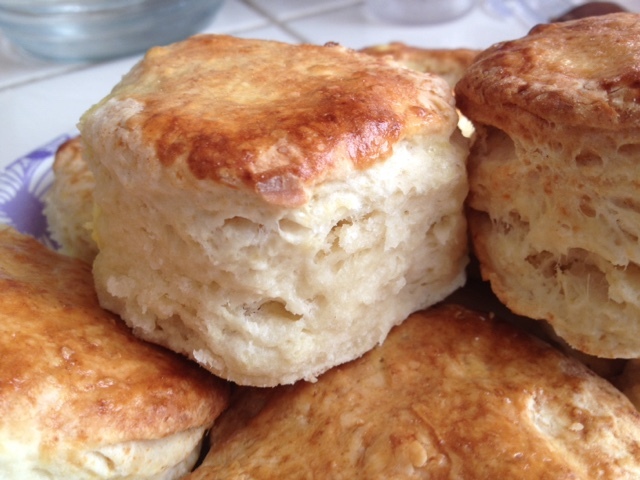 1-1/2 Cups - Pastry Flour - Use only 2-1/2 Cup in a large mixing bowl. Save 1/2 C aside for work surface. Total of 1/2 C of warm water: Mix all dry mixture with 1/3 Cup of warm water. Add the rest as needed to form a soft dough. Add more water a bit at a time to form into a soft dough. 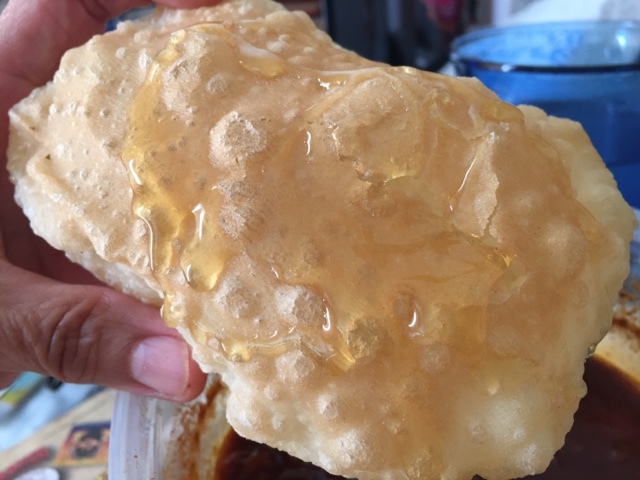 Place in lightly greased plastic bag. 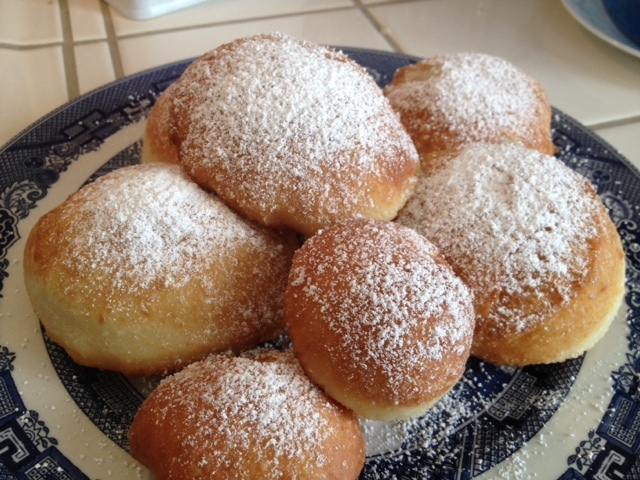 3 Cups - Pastry Flour - Use only 2-1/2 Cup in a large mixing bowl. Save 1/2 C aside for work surface. 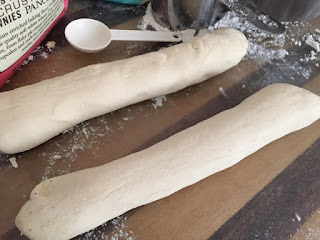 Mix 1 Cup of warm water, but save 1/4 C.
Mix the flour into shaggy dough with chop sticks or large spatula or with your hand. 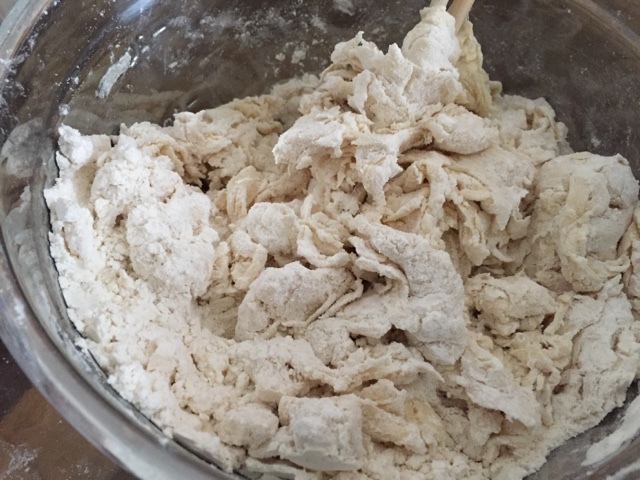 After making the new dough, combine the new and preferment dough. Knead well - about 2 min. Place in lightly greased plastic bag. 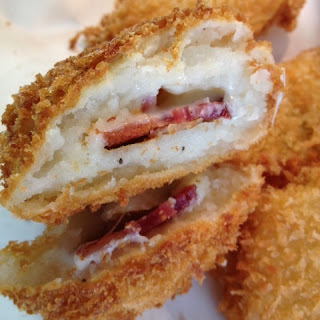 Rest in Refrigerator - at least for 30 minute. Bring out the dough and divide them into 1/3 each. 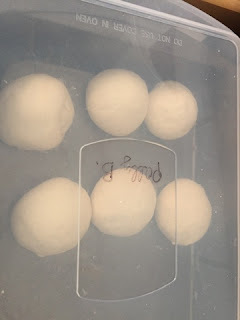 Save 1/3 of the dough away in a plastic bag tightly and place in refrigerator for next day project. 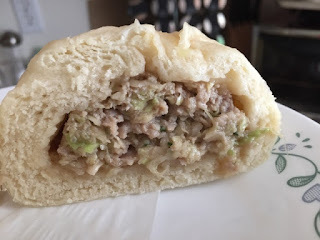 To make MI ZXE TSA SAO BAO, This is without using the purchased BBQ - Tsa Sao / Chia Xiu pork. Add 1/3 C warm water in a medium bowl. With hand shred the whole dough into golf ball size chunks. Just shred into the water. Mix all together with Chop sticks. The dough will look shaggy. Then, take the dough out to the work surface - no flour on the work surface. 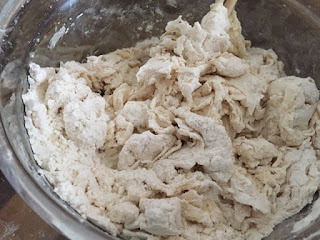 Add 2 TB Oil to the dough, then, start Kneading the dough until all oil is mixed in. 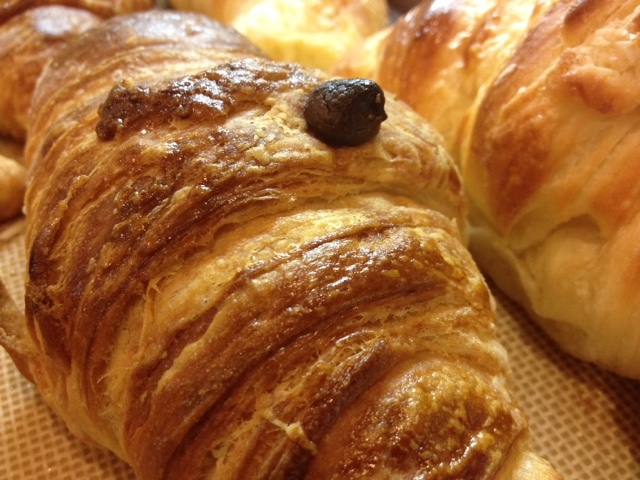 Your hand should not be sticky when the dough is nice and smooth and the dough would not stick to the work surface. It means the dough is ready. 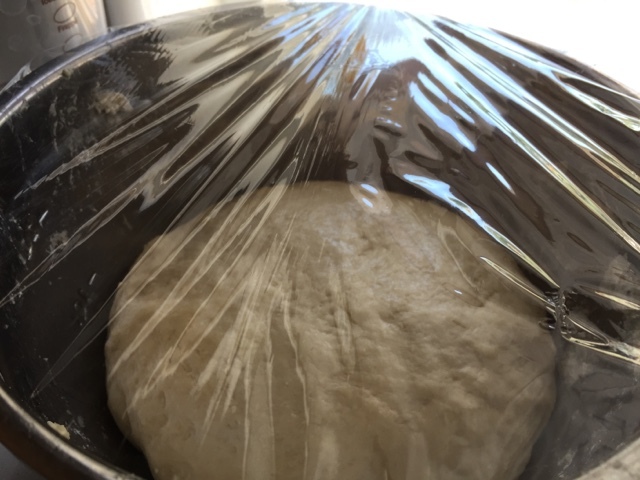 Cover and rest the dough for 5 minutes. Premix 1 TB flour, 2 TB Corn flour (corn starch), with 1/2 C water. Set it aside. Add 3 TB Oil into a wok and stir fry onions and pork cubes. Add 2-3 TB Oyster Sauce; 3 TB Soy Sauce; 3 TB sugar. Add food color paste if you want, but I didn't; Beet juice is an alternative to make it red in color. Add flour slur - cook till the meat mixture is thickened. Slice the dough into 12 pieces on floured work surface. 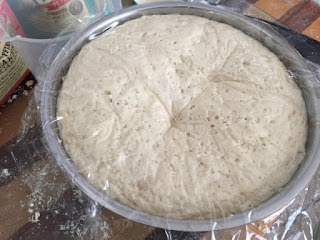 Roll the dough into THICK disc. Thick in center, but "slightly" thinner at outer edge, but not 'thin". Fan fold the dough, but Do Not Close the folded dough - Leave the opening at the top. 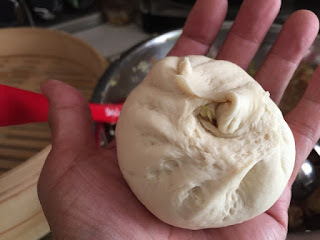 Or close the dough and Invert the dough in the palm of your hand and roll the dough between the palms of your hand. 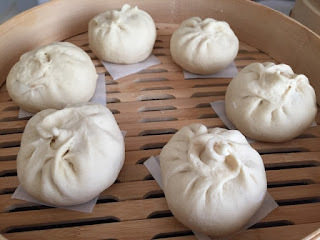 Place the bao on the cut parchment paper. Using scissor, cut the top open - but not too big. Steam for 12 min in High Heat. Remove the steamer basket still with lid on from the steamer pot. 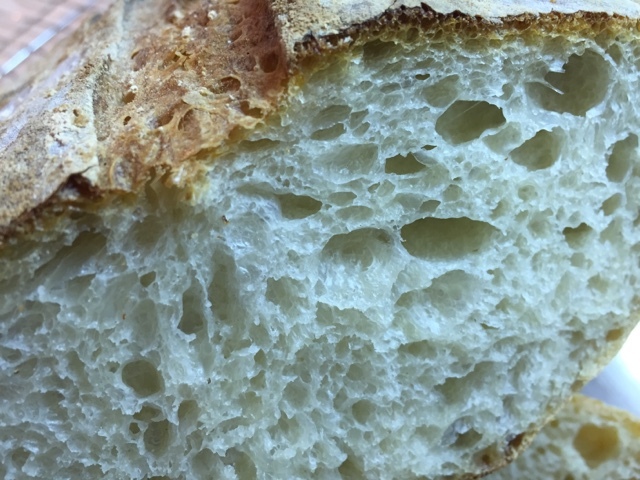 The ones with crisscross opening did not open up like the ones purchased at the market or at the restaurant, but the formula turned out pretty good. And I don't believe in those Snow White BAO you eat at the Dim Sum Gio Row - meaning at the restaurants that serves Dim Sum where Chia Xiu Bao's dough is 'Snow White'. I don't care if you add liquid milk or powder milk, it is inconceivable without adding titanium. Anyone succeeded in making a Snow White bun without additive, please show me. I would like to test out the formula. Combine everything except oil. Combine with chop sticks until water is absorbed; then add oil. Knead until smooth. 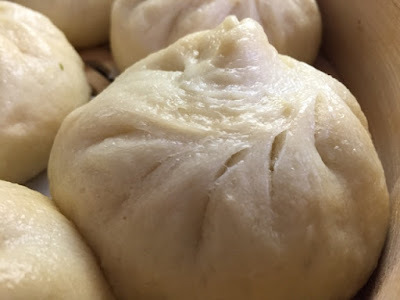 For ZON ZONG FASHIAO FA - for Preferment method - divide the dough into two, and place each in oiled plastic bag, refrigerate for 4 hours or more in plastic bag. 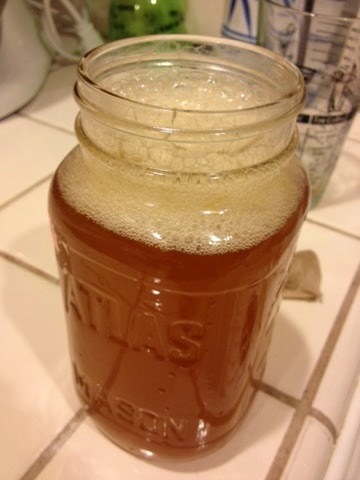 Mix sugar and yeast into water. 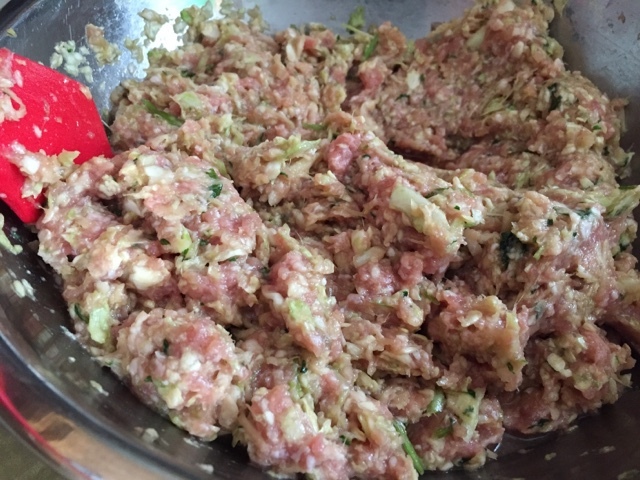 Hand shred MIEAN ZONG and add pieces into the mixture. Add flour, then mix with chopsticks. Start kneading the dough until smooth. Cover and place in warm place for about 10 to 15 min. 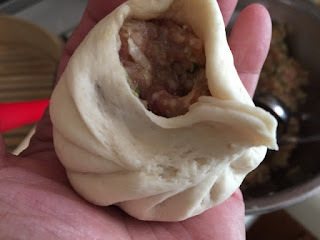 Take 1/3 of the dough can be used for cold MIEAN ZONG. 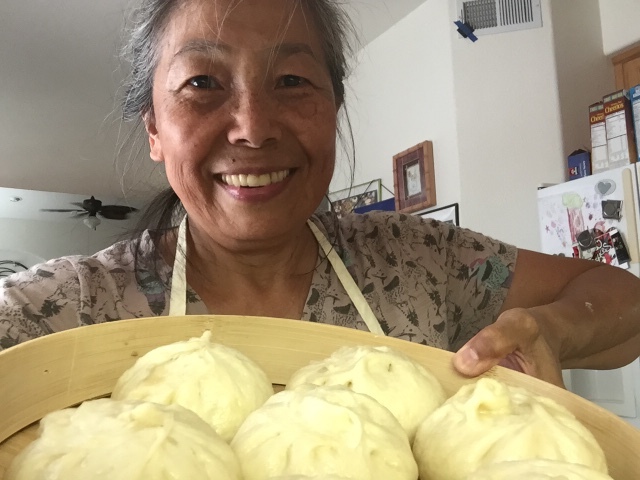 Since I started on this blogging many years ago, I've tried several recipes from here and there, etc. From time to time, I looked at my kitchen gadgets and wondered often why do I have so many of them. Just recently, I was viewing the 10 things this and that you should know or avoid at YouTube sites. And they reminded me why I have those gadgets and recipes and formulas when I could just go out and buy them. It's because they got all these wierd additives and drivatives made from - "Surprise! ", and I don't think none of us like those surprise I-Cysteine, dough conditioner, in our flour or in our baked goods. What is I-Cysteine made from? Check it yourself. Then there is the Red food color... why I want to find a way to produce it from Beets, Cherries, etc. myself, instead of buying food made with food color or 'Carmine"; And those Vanilla flavored ice-cream made from Castoreum. So, again, I have to vamp up my energy and continue with my home cooking and not being lazy to give in.